Lua error in Module:Location_map at line 488: Unable to find the specified location map definition: "Module:Location map/data/Vardaska" does not exist. 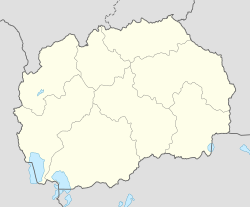 Strumica (Macedonian: Струмица [ˈstrumit͡sa] ( listen)) is the largest city in eastern Republic of North Macedonia, near the Novo Selo-Petrich border crossing with Bulgaria. About 100,000 people live in the region surrounding the city. It is named after the Strumica River which runs through it. The city of Strumica is the seat of Strumica Municipality. The town is first mentioned in the 2nd century BC with the Greek name Αστραίον (Astraîon, "starry") by Ptolemy and Pliny. It was known as Tiberiopolis in Roman times, and received its present name from the Slavic settlers of the Middle Ages. In modern Greek the town is known as Στρώμνιτσα (Strómnitsa), and in Turkish Ustrumca. Strumica is located in the southeastern part of the country, close to the borders with Greece (15 km) and Bulgaria. It is situated in the geographical region of the Strumica Field, where the field meets the highland elevating into the Plavuš (west) and Belasica (south) mountains. The Struma river flows north of the city, while several tributaries flow through the city area. Strumica has a humid subtropical climate (Köppen climate classification: Cfa). According to archeological findings, settlement of the area dates back to 6000–5000 BC: a Neolithic settlement (Stranata) located near the village of Angelci, as well as findings from the Emperor's Towers site near Strumica, where traces of a prehistoric culture existed from the early 4th to mid 3rd millennium BC were discovered. The area was populated later by the Paionians. The first mention of the city under the name Astraion is in the writings of the Roman historian Titus Livius in 181 BC regarding the execution of Demetrius, brother of the Ancient Macedonian king Perseus (179–168 BC), son of Philip V of Macedon (221–179 BC). The name Astraion came from the Paionian tribe called Astrai. In 148 BC the region became a Roman province. In the Roman period the city changed its name to Tiberiopolis, which is evidenced by a marble statue base dedicated to the patron Tiberius Claudius Menon, who lived between the late 2nd and early 3rd century AD. During the reign of the Roman emperor Julian the Apostate (361–363 AD), the fifteen holy hieromartyrs of Tiberiopolis were killed. In 395, the Roman Empire split, and Macedonia fell under the Eastern Roman Empire (the Byzantine Empire). After that, Tiberiopolis became part of the province Macedonia Salutaris or Macedonia Secunda in the late 4th century. The urban mansion Machuk dating from the late ancient period today stands witness for the existence of a city settlement from that time. In the 6th and 7th centuries, the Roman town became subject of Slavic migration . The Strymonites, a Sclaveni tribe, adopted their name after the Strymon river (Struma). The Strymonites were independent until the 9th century, followed by a Byzantine reconquest. Later on, the Strumica region was conquered by Bulgarian Khan Presian (836–852). The Strumica region remained part of the Bulgarian state throughout a period of more than 150 years right up until 1014, when it was retaken by the Byzantines. In the 11th century, written sources begin to refer to the town with its Slavic name as Strumica. By the end of the 12th century, the Byzantine central power had weakened and, as a result, many local lords broke away and became independent. Initially, the leader of the Vlachs and Bulgarians in eastern Macedonia Dobromir Chrysos (1185–1202) and later the Bulgarian sebastokrator and a member of the Asen dynasty in Veliko Tarnovo Strez (1208–1214) held the region, which became part of the Bulgarian kingdom in 1202. In the second half of the 13th century the city was recovered by the Byzantine Empire until the Serbian Kingdom conquered the region in the 14th century. Serbian magnate Hrelja ruled Strumica and the nearby region until 1334, when it was put under the direct rule of Serbian King Stefan Dušan who continued his conquest to the south. During the Fall of the Serbian Empire, the Strumica region was first ruled by Uglješa, the brother of magnate Vukašin. Strumica itself was then governed by Dabiživ Spandulj, who served the Dejanović brothers. The Ottoman Empire finally conquered Strumica in 1383. Under Ottoman administration, the town was named Üstrümce. It belonged to the Sanjak of Kyustendil, and the timarli-sipahi system was established. Nomads and livestock breeders of Turkic origin were settled, which altered the general look of the city making it more oriental. According to the census of 1519, Strumica had a population of 2,780, of which 1,450 were Christians and 1,330 were Muslims. These were times when conversion to Islam was at its peak in the region, which accounts for the increased number of Muslims (2,200) compared to Christians (1,230) according to the census of 1570. In the 17th century, it became seat of a kadiluk. At about this time, Strumica was visited by the Turkish travel writers Haji Kalfa (1665) and Evliya Çelebi (1670), who gave a description of the city and all its Islamic buildings. In the late 18th and early 19th century, Strumica was part of the Sanjak of Salonica. During the 19th century the influence of the Patriarchate of Constantinople increased, and so did the number of pro-Greek citizens. Countering this, the Bulgarian Exarchate found support in the Slavic populace; the first Bulgarian school in the Strumica region was opened in Robovo in 1860, and its first teacher was Arseni Kostencev from Štip. This period coincided with the work of the great fresco masters from Strumica – Vasil Gjorgiev and Grigorij Petsanov. They did work in many churches built in the Strumica region at the time. In the late 19th and early 20th century, Strumica was part of the Salonica Vilayet. Following the Berlin Congress of 1878, when Turkey lost a sizable portion of its territory on the Balkans, a stream of refugees flowed into the area; some of them ending up in Strumica. These people were called "muhajirs". The Internal Macedonian Revolutionary Organization for the Ograzden county was formed and operated in these parts. One of the most prominent leaders of the organization in Strumica was Hristo Chernopeev, who took part in the Young Turk Revolution (1908–09). The outcome of this effort did not bring freedom to the local people who still remained under Ottoman rule. In the First Balkan War of 1912 the Turks were defeated and driven out of Macedonia (region) by the joint effort of the Balkan League (Serbia, Bulgaria, Greece and Montenegro). Bulgaria annexed the town of Strumica. In the Second Balkan War (1913), which was fought between the three of the Balkan allies against Bulgaria, the latter was defeated, however, according to the Bucharest treaty (28 July 1913) Strumica stayed under Bulgarian rule. The Greek army stationed in Strumica were revolted by the decision for withdrawal and set the town on fire. It burned from 8 until 15 August 1913, when more than 1900 public buildings, private houses and other constructions were burnt. Strumica was made the center of a homonymous district in Bulgaria (largely corresponding to the present day Blagoevgrad province) and stayed under Bulgarian rule until 1919, when it was ceded to the Kingdom of Serbs, Croats and Slovenes after the Treaty of Neuilly-sur-Seine. From 1929 to 1941, Strumica was part of the Vardar Banovina of the Kingdom of Yugoslavia. On 6 April 1941, the first day of the Axis invasion of Yugoslavia, Strumica was captured by the German Army and, as Bulgaria was allied with Germany, Strumica was turned over under occupation of the Bulgarian armies on 18 April 1941. From 1941 to 1944, Strumica, as most of Vardar Macedonia, was annexed by the Kingdom of Bulgaria. On 11 September 1944 the Bulgarian army withdrew from Strumica and on 5 November 1944, the German army also left the town. After the war it became part of the Socialist Republic of Macedonia, one of the republics of Federal Yugoslavia. With the referendum on 8 September 1991, amid the breakup of Yugoslavia, the country became independent under the constitutional name Republic of Macedonia. Strumica is the main agricultural center in North Macedonia. It has food industry, textile factories and a developed domestic and international trade network. The city of Strumica has four primary schools: Vidoe Podgorec, Sando Masev, Marshal Tito and Nikola Vapcarov; three high schools: Jane Sandanski, Nikola Karev and Dimitar Vlahov; one dispersed university Goce Delcev, which has three faculties, including Teacher Training, Economic, and Agriculture; first private university "FON," which has six faculties, including Law, Economy, Sport Management, Detectives and Security, Communication and IT, Foreign Languages; and a music school Boro Dzoni. There are few main football clubs. In 2017 year Akademija Pandev will be in elite division Macedonian First League. FK Horizont Turnovo plays in the Macedonian Second League, while FK Belasica play in the Second and FK Tiverija in the Third. Also women's team of FK Tiverija plays in first division. Two basketball clubs train and play in Strumica after reorganization of KK Strumica 2005: KK Aba and KK Milenium. Volleyball clubs in Strumica are OK Makedonija-Gio, OK Strumica, and women's team OK Makedonija-Maks. Handball team RK Zomimak-M is also present. There are one private local TV stations - TV kanal VIS and two radio stations Ekspres radio and Hit Radio and two cable TV providers: NetCable and Telekabel. 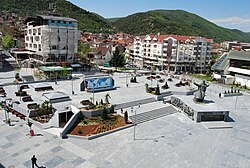 The population of the municipality of Strumica is 54,676. ^ Branigan, Keith (1992). Lexicon of the Greek and Roman cities and place names in antiquity, ca. 1500. Adolf M. Hakkert. ISBN 90-256-0985-6. . Text says "Unlocated town in Macedonia, also called Astraion, mentioned by Ptolemy and Pliny"
^ "Climate: Strumica". Climate-Data.org. Retrieved January 30, 2018. ^ Paul Mojzes, Yugoslavian Inferno: Ethnoreligious Warfare in the Balkans, Bloomsbury Academic Publishing, 2016, ISBN 1474288383, p. 46. This page was last edited on 25 April 2019, at 20:05 (UTC).